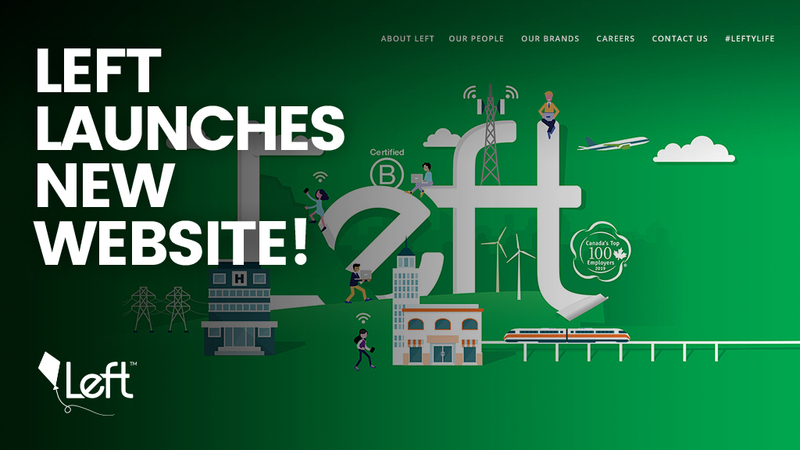 The Left team is proud to announce the rebrand of our website www.left.io! Built with our community in mind, our new site provides a clear message of who we are, our amazing culture, and what we’re building. With our new clean design we’ve made the website more intuitive for our community and job seekers. We’ve also improved the structure of our content, so you’ll get more from scrolling our homepage, including our announcements, awards, and global goals for sustainability development. We’ve refreshed our #LeftyLife blog to provide our community with updates into the going ons at Left. To make sure you don’t miss a thing, we’ve also included a live social feed stream from our Facebook. Lastly, we’ve revamped our ‘careers page’ to provide insight into our culture and how we empower our global team to make their mark. We hope that you like our new look, and if you have any feedback, please let us know on Facebook or Twitter. Left is a B-Corp Certified, Canadian multinational media and technology company committed to using technology for positive social impact. Officially one of Canada’s Top 100 Employers, Left has grown to a global team of over 160. Left Travel, a brand of Left, has been using big data, A.I., and predictive analysis to convert high search intent traffic into quality bookings for hotels and short-term stays since 2010. With its mobile mesh networking project powered by blockchain and tokenization, RightMesh, Left is addressing the global challenge of connectivity — particularly in regions where the digital divide is greatest. Headquartered in the Vancouver-based suburb of Maple Ridge, BC, Left has offices and employees in Bangladesh, Singapore and the United States. RightMesh AG, a Swiss registered fully owned subsidiary of Left, contracts the research and development of the RightMesh project to Left.